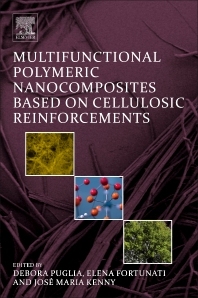 Multifunctional Polymeric Nanocomposites Based on Cellulosic Reinforcements introduces the innovative applications of polymeric materials based on nanocellulose, and covers extraction methods, functionalization approaches, and assembly methods to enable these applications. The book presents the state-of-the-art of this novel nano-filler and how it enables new applications in many different sectors, beyond existing products. With a focus on application of nano-cellulose based polymers with multifunctional activity, the book explains the methodology of nano-cellulose extraction and production and shows the potential performance benefits of these particular nanostructured polymers, for applications across different sectors, including food active packaging, energy-photovoltaics, biomedical, and filtration. The book describes how the different methodologies, functionalization, and organization at the nano-scale level could contribute to the design of required properties at macro level. The book studies the interactions between the main nano-filler with other active systems and how this interaction enables multi-functionality in the produced materials. The book is an indispensable resource for the growing number of scientists and engineers interested in the preparation and novel applications of nano-cellulose, and for industrial scientists active in formulation and fabrication of polymer products based on renewable resources. Research scholars and postgraduate students in plastics engineering/materials science/nanotechnology academic departments. Application-focused Polymer engineers and researchers in industry R&D. 2.4 Bacterial Nanocellulose Production: Why Look for Alternative Raw Materials? Researcher and Lecturer at the University of Perugia. She is author of 74 scientific publications (h=19) in the field of polymeric composites and nanocomposites. Elena Fortunati, graduated in 2007 in Materials Engineering and she was awarded a Ph.D. in Nanotechnology of Materials at the University of Perugia, in 2010. Since January 2011 she has been a researcher (post-doctoral) at the Civil and Environmental Engineering Department/Faculty of Engineering /Materials Science and Technology (STM) Group. She has attended and spoken at over 30 International Conferences and is author of more than 50 articles in refereed journals and book chapters, most of them concerning waste re-valorization and use, extraction of cellulose nanocrystals and their use in nanocomposites for industrial applications. Professor of Materials Science and Technology at the University of Perugia and Director of the European Centre for Nanostructured Polymers. Authored more than 480 scientific publications (h=48) on the processing of polymers, composites, and nanocomposite materials.